Pre-race shakeout run in CA. How powerful is that?! And I can’t agree more. Training takes the obvious – determination, motivation, and perseverance; but there is so much more to it that we forget about. It takes time. Goals are not reached overnight, but too often we want things yesterday. It also takes regular sleep, proper nutrition and hydration, proper training, cross-training and maintenance, and it takes small goals along the way to achieving your master plan. We can’t just talk about motivation and determination – it’s so easy to say “I want to be an Olympian.” Ok. What does that mean?! What does it take?! And then how do you reach each tiny step along the way to get there? 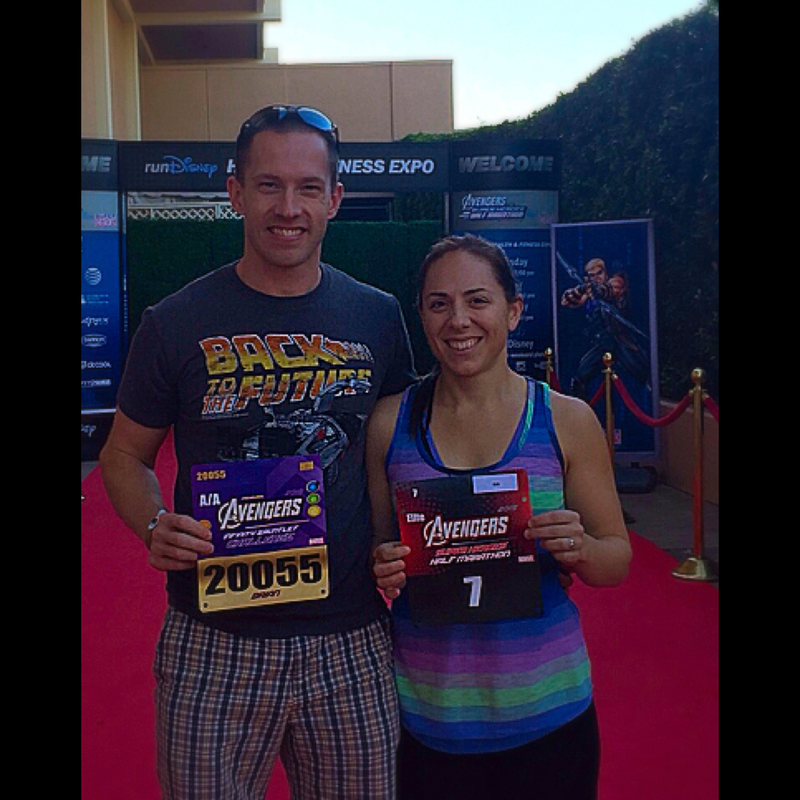 Bib pickup for Disney Half. Brian asked if I would go with him on this adventure a couple months ago, and of course I could not pass up the opportunity. I have not raced a road half marathon in nearly two years when I took 4th at the Get Lucky Half in Chicago, IL (2014). I had then converted to the ultra scene by that summer, with no desire to road race in the near future. So why not go do two back to back half marathons? !…I love Disney anyways! One of the last Disney race experiences I had was a complete success on paper, finishing 6th overall with 4 Olympians ahead of me, but definitely not successful based on my goals and simply what was playing out in my head that day. So I was a bit nervous going back to the same race course, but that worked to my advantage in the end. We woke up Sunday morning at 2:30am to get ready for the 5:30am start. It’s so early! We had spent all day Saturday on our feet in the parks (and running of course in the morning) – so this otta be great! I fueled and hydrated as I would for any race and I was able to get in a solid 30 minute warm up before the start. I was planning to race with no goal in mind since it’s been so long – I just wanted to push it hard. I knew in my head it would be good to start conservatively and focus more on settling into a comfortable pace I could hold beyond the half distance. I also knew Brian wanted to PR. With all of those factors, I decided while warming up in front of the start line I would pace Brian to a solid half marathon time; a sub 7. We were off and it felt like millions of runners passed us, but that’s the best part….returning the pass a few minutes or miles later. We settled into a 650-700 min/mi and I simply went into autopilot. I knew in the first 5k that this would be a successful day of racing for us both. I used some of the Run Mindful tactics learned from Timmy Olson during this time which helped immensely clear my head and get into race mode, something I seemed to forget these last few runs! I engaged in positive self-talk, embraced any pain or discomfort I felt, and simply breathed. It’s amazing how much better you run when you are relaxed. Its faster and so smooth! I told Brian to “go” at 10.5 miles which was mostly strategic – I know he can negative split a 5k distance. It was his time to show what he can do. I, on the other hand, ran out of water and given I’m not the best at stopping at stations later in the race, my pace dropped to a 658-705. I was okay with it. I was able to see what the problem was and did what I could with the last 2 miles to hold onto pace. Finished in 1:31:43; 7th overall female and 2nd in my division. 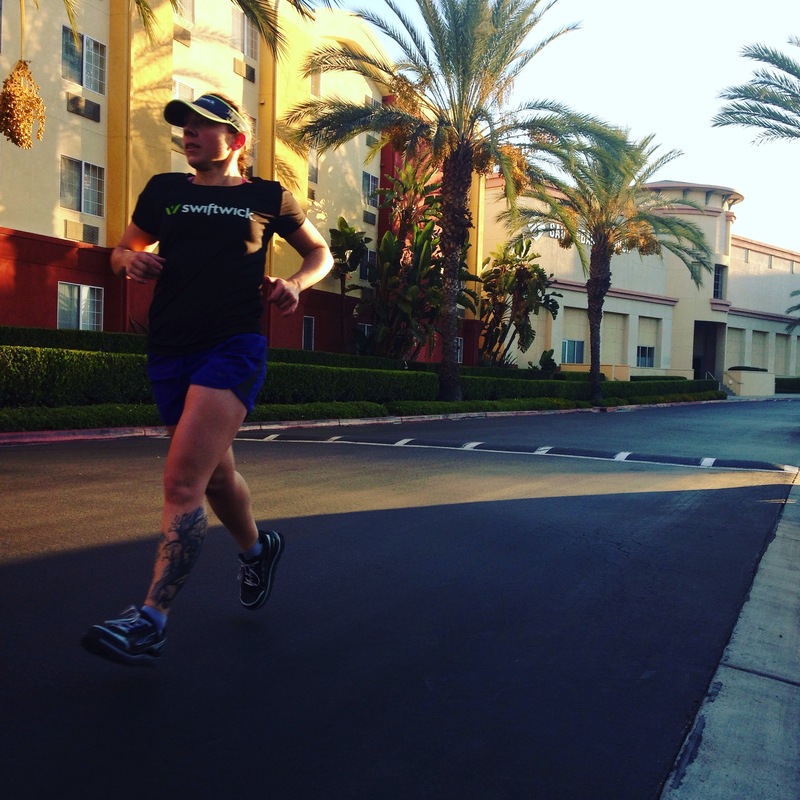 For not racing a road run in quite some time, I was completely satisfied with my performance. My time was nothing special, but it was all those other gains that really made the difference for me. Its not always about what’s on paper, right?! It wasn’t too long after finishing … we were off to VEGAS! I can’t say I’m a huge Rock n’ Roll run series fan, but was definitely looking forward to a fun run to make it 26 miles for the day! 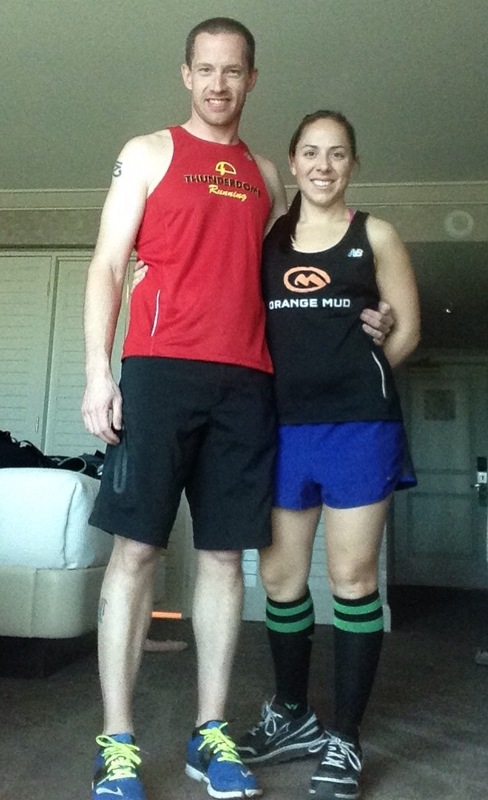 We arrived in Las Vegas a couple hours before the 4:30pm start and headed to the start line. We were in the front corrals, which was great because there are about 4 million people that run this! The weather was seemingly unusual – it felt like a tropical storm was approaching. The winds were so bad…mile markers were removed, water tables were turned over, and the rain water made the roads super slippery. Our goal for this race….just simply have fun and make sure not to get blown away! Success once again! We finished together in 1:47. All we both could think about was eating and sitting. So that’s what we did 🙂 A lot of it too! The absolute best part about the RnR marathon/half marathon was seeing Rivs on the other side of the turn around. He was mixed in with other full/half marathoners and appeared to be smiling! I’m not too sure how we all spotted each other (because there were 4 zillion people running), but that was the coolest thing in the world! Rivs ended up taking 2nd place in the marathon and definitely proved he’s back – let the roads be taken over! Shoes/Socks: Altra Olympus 1.5 – held up perfectly the whole weekend of running – looking forward to trying the 2.0s! Swiftwick Socks are all I wear anymore. I never have blisters or feet issues and the compression is perfect for any distance. Nutrition/Hydration: V-Fuel gels – they sit so well, its amazing. Again, I wouldn’t recommend anything else for fueling if using gels. Water and Spark were in my Orange Mud handheld – no chafing or issues with my handheld as I’ve experienced in the past with different products. Always have confidence in OM and V-Fuel!